In honor of Sci-Fi Month, I’m featuring sci-fi picks for my Waiting on Wednesday posts for the whole of November. Since this is the final week before we head into December, I’m closing off with one of my greatest loves: STAR WARS. Behold this gorgeous cover featuring two of the greatest villains in Star Wars history! I really enjoyed reading about the origins of our favorite Chiss Admiral in last year’s Thrawn, so I’m curious to see where Zahn will be taking him next in this follow-up novel. 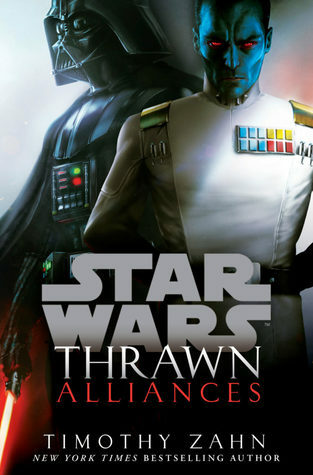 “Grand Admiral Thrawn and Darth Vader ally against a threat to the Empire in this new novel from bestselling author Timothy Zahn. Oh nice! That’s a new to me one! I hope you love it once you get to read it! I still haven’t caught up with the newer Star Wars films! Never read a Star Wars book but really enjoy the movies. Can’t wait for the new one! I’ve noticed too that they seem to be putting out a lot more books focusing on the “dark side” POV in the new canon! Hope you love it and it proves to be a strong addition. STAR WARS! OMG I can’t wait for the new movie in a few weeks. I’ve yet to read any of the Star Wars books though. :O I hope you enjoy this book when you get the chance to read it!